Instead of putting the whole bowl under the broiler to melt the cheese (traditional way), I cut the baguette into cubes, put cheese on top, and broiled it a bit. I, then, put the cheesy croutons on top of the soup. This way, the bowl wasn’t too hot for the kids. 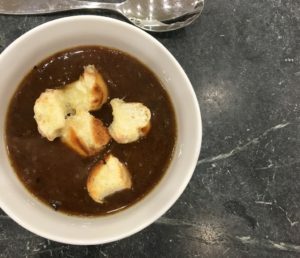 We love French Onion Soup in our house! Melt the butter and oil together in a Dutch oven over medium low heat. Add the onions, toss to coat them in oil and cover the pot. Reduce the heat low and let them cook for 15 minutes. They don’t need your attention at this point; now would be a good time to touch up your eye makeup that you cried off during the onion chopping process! After 15 minutes, uncover the pot, raise the heat to medium and stir in the salt and sugar. 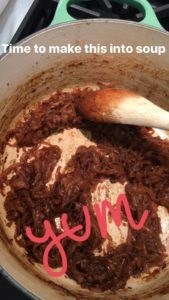 Cook onions, stirring frequently, for 45 minutes until they have turned an even, deep golden brown. After the onions are fully caramelized, sprinkle them with flour and cook for 3 minutes, stirring constantly. Add the wine to deglaze the pan, scraping up all the bits from the bottom of the pan. Then add the stock, a little at a time, stirring between additions. Season to taste with salt and pepper. Add bay leaf. Bring to a simmer and simmer partially covered for 30 to 40 more minutes, or longer. To serve: cut french bread to fit broiler-safe bowls. Broil bread on high for less than a minute, until browned on one side. Put browned side down on top of each soup bowl and top with grated cheese (as much as you want). Put bowls on a cookie sheet and broil soups until bubbly and golden. Copyright © 2017 Our Everyday Dinners - This is an easy recipe for how to make French Onion Soup.